The AFL was created by a number of owners who had been refused NFL expansion franchises or had minor shares of NFL franchises. The AFL's original lineup consisted of an Eastern division of the New York Titans, Boston Patriots, Buffalo Bills, and the Houston Oilers, and a Western division of the Los Angeles Chargers, Denver Broncos, Oakland Raiders, and Dallas Texans. The league first gained attention by signing 75% of the NFL's first-round draft choices in 1960, including Houston's successful signing of Heisman Trophy winner Billy Cannon. While the first years of the AFL saw uneven competition and low attendance, the league was buttressed by a generous television contract with ABC (followed by a contract with NBC for games starting with the 1965 season) that broadcast the more offense-oriented football league nationwide. Continuing to attract top talent from colleges and the NFL by the mid-1960s, as well as successful franchise shifts of the Chargers to San Diego and the Texans to Kansas City, the AFL established a dedicated following. The transformation of the struggling Titans into the New York Jets under new ownership further solidified the league's reputation among the major media. As fierce competition made player salaries skyrocket in both leagues, especially after a series of "raids", the leagues agreed to a merger in 1966. Among the conditions were a common draft and a championship game played between the two league champions, which would eventually become known as the Super Bowl. The AFL and NFL operated as separate leagues until 1970, with separate regular season and playoff schedules except for the championship game. During this time the AFL added the Miami Dolphins and Cincinnati Bengals. After losses by Kansas City and Oakland in the first two AFL-NFL Championship Games to the Green Bay Packers, the New York Jets and Kansas City Chiefs won Super Bowls III and IV respectively, cementing the league's claim to being an equal to the NFL. During the 1950s, the National Football League had grown to rival Major League Baseball as one of the most popular professional sports leagues in the United States. One franchise that did not share in this newfound success of the league was the Chicago Cardinals, owned by the Bidwill family, who had become overshadowed by the more popular Chicago Bears. The Bidwills hoped to relocate their franchise, preferably to St. Louis but could not come to terms with the league on a relocation fee. Needing cash, the Bidwills began entertaining offers from would-be investors, and one of the men who approached the Bidwills was Lamar Hunt, son and heir of millionaire oilman H. L. Hunt. Hunt offered to buy the Cardinals and move them to Dallas, where he had grown up. However, these negotiations came to nothing, since the Bidwills insisted on retaining a controlling interest in the franchise and were unwilling to move their team to a city where a previous NFL franchise had failed in 1952. While Hunt negotiated with the Bidwills, similar offers were made by Bud Adams, Bob Howsam, and Max Winter. After Winter and Boyer agreed to start a team in Minneapolis-Saint Paul, the new league had its first four teams. Hunt then approached Willard Rhodes, who hoped to bring pro football to Seattle. However, the University of Washington was unwilling to let the fledgling league use Husky Stadium, probably due to the excessive wear and tear that would have been caused to the facility's grass surface. With no place for his team to play, Rhodes' effort came to nothing. Hunt also sought franchises in Los Angeles, Buffalo and New York City. During the summer of 1959, he sought the blessings of the NFL for his nascent league, as he did not seek a potentially costly rivalry. Within weeks of the July 1959 announcement of the league's formation, Hunt received commitments from Barron Hilton and Harry Wismer to bring teams to Los Angeles and New York, respectively. His initial efforts for Buffalo, however, were rebuffed, when Hunt's first choice of owner, Pat McGroder, declined to take part; McGroder had hoped that the threat of the AFL would be enough to prompt the NFL to expand to Buffalo. On August 14, 1959, the first league meeting was held in Chicago, and charter memberships were given to Dallas, New York, Houston, Denver, Los Angeles, and Minneapolis-Saint Paul. On August 22 the league officially was named the American Football League. The NFL's initial reaction was not as openly hostile as it had been with the earlier All-America Football Conference (Bell had even given his public approval), yet individual NFL owners soon began a campaign to undermine the new league. AFL owners were approached with promises of new NFL franchises or ownership stakes in existing ones. Only the party from Minneapolis accepted, and the Minnesota group joined the NFL the next year in 1961; the Minneapolis group were joined by Ole Haugsrud and Bernie Ridder in the new NFL team's ownership group, with was named the Minnesota Vikings. The older league also announced on August 29 that it had conveniently reversed its position against expansion, and planned to bring NFL expansion teams to Houston and Dallas, to start play in 1961. (The NFL did not expand to Houston at that time, the promised Dallas team – the Dallas Cowboys – actually started play in 1960, and the Vikings began play in 1961.) Finally, the NFL quickly came to terms with the Bidwills and allowed them to relocate the struggling Cardinals to St. Louis, eliminating that city as a potential AFL market. The Oilers became the first-ever league champions by defeating the Chargers, 24–16, in the AFL Championship on January 1, 1961. Attendance for the 1960 season was respectable for a new league, but not nearly that of the NFL. In 1960, the NFL averaged attendance of more than 40,000 fans per game and more popular NFL teams in 1960 regularly saw attendance figures in excess of 50,000 per game, while CFL attendances averaged approximately 20,000 per game. By comparison, AFL attendance averaged about 16,500 per game and generally hovered between 10,000-20,000 per game. Professional football was still primarily a gate-driven business in 1960, so low attendance meant financial losses. The Raiders, with a league-worst average attendance of just 9,612, lost $500,000 in their first year and only survived after receiving a $400,000 loan from Bills owner Ralph Wilson. In an early sign of stability, however, the AFL did not lose any teams after its first year of operation. In fact, the only major change was the relocation of the Chargers from Los Angeles to nearby San Diego. 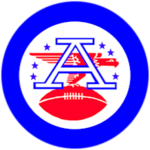 On August 8, 1961, the AFL challenged the Canadian Football League to an exhibition game that would feature the Hamilton Tiger-Cats and the Buffalo Bills. Playing at Civic Stadium in Hamilton, Ontario, the Tiger-Cats defeated the Bills 38–21 playing a mix of AFL and CFL rules. After the 1963 season, the Newark Bears of the Atlantic Coast Football League expressed interest in joining the AFL; concerns over having to split the New York metro area with the still-uncertain Jets were a factor in the Bears bid being rejected. In early 1965, the AFL awarded its first expansion team to Rankin Smith of Atlanta. The NFL quickly counteroffered Smith a franchise, which Smith accepted; the Atlanta Falcons began play as an NFL franchise. In March 1965, Joe Robbie had met with Commissioner Foss to inquire about an expansion franchise for Miami. On May 6, after Atlanta's exit, Robbie secured an agreement with Miami mayor Robert King High to bring a team to Miami. League expansion was approved at a meeting held on June 7, and on August 16 the AFL's ninth franchise was officially awarded to Robbie and television star Danny Thomas. The Miami Dolphins joined the league for a fee of $7.5 million and started play in the AFL's Eastern Division in 1966. For more details on this topic, see AFL–NFL merger. The last game in AFL history was the AFL All-Star Game, held in Houston's Astrodome on January 17, 1970. The Western All-Stars, led by Chargers quarterback John Hadl, defeated the Eastern All-Stars, 26–3. Buffalo rookie back O.J. Simpson carried the ball for the last play in AFL history. Hadl was named the game's Most Valuable Player. Prior to the start of the 1970 NFL season, the merged league was organized into two conferences of three divisions each. All ten AFL teams made up the bulk of the new American Football Conference. To avoid having an inequitable number of teams in each conference, the leagues voted to move three NFL teams to the AFC. Motivated by the prospect of an intrastate rivalry with the Bengals as well as by personal animosity toward Paul Brown, Cleveland Browns owner Art Modell quickly offered to include his team in the AFC. He helped persuade the Pittsburgh Steelers (the Browns' archrivals) and Baltimore Colts (who shared the Baltimore/Washington, D.C. market with the Washington Redskins) to follow suit, and each team received US $3 million to make the switch. All the other NFL squads became part of the National Football Conference. The AFL was also the most successful of numerous upstart leagues of the 1960s and 1970s that attempted to challenge a major professional league's dominance. All nine teams that were in the AFL at the time the merger was agreed upon were accepted into the league intact (as was the tenth team added between the time of the merger's agreement and finalization), and none of the AFL's teams have ever folded. For comparison, the World Hockey Association (1972–79) managed to have four of its six remaining teams merged into the National Hockey League, which actually caused the older league to contract a franchise, but WHA teams were forced to disperse the majority of their rosters and restart as expansion teams. The merged WHA teams were also not financially sound (in large part from the expansion fees the NHL imposed on them), and three of the four were forced to relocate within 20 years. The American Basketball Association (1967–76) managed to have only four of its teams merged into the National Basketball Association, and the rest of the league was forced to fold. Both the WHA and ABA lost several teams to financial insolvency over the course of their existences. The Continental League, a proposed third league for Major League Baseball that was to begin play in 1961, never played a single game. Historically, the only other professional sports league in the United States to exhibit a comparable level of franchise stability from its inception was the American League of Major League Baseball. Kevin Sherrington of The Dallas Morning News has argued that the presence of AFL and the subsequent merger radically altered the fortunes of the Pittsburgh Steelers, saving the team "from stinking". Before the merger, the Steelers had long been one of the NFL's worst teams. Constantly lacking the money to build a quality team, the Steelers had only posted eight winning seasons, and just one playoff appearance, since their first year of existence in 1933. They also finished with a 1-13 record in 1969, tied with the Chicago Bears for the worst record in the NFL. The $3 million indemnity that the Steelers received for joining the AFC with the rest of the former AFL teams after the merger helped them rebuild into a contender, drafting eventual-Pro Football Hall of Famers like Terry Bradshaw and Joe Greene, and ultimately winning four Super Bowls in the 1970s. Since the 1970 merger, the Steelers have the NFL's highest winning percentage, the most total victories, the most trips to either conference championship game, are tied for the most trips to the Super Bowl (with the Dallas Cowboys, New England Patriots, and Denver Broncos), and have won an NFL-record six Super Bowl championships. In 2009, a five-part series, Full Color Football: The History of the American Football League, on the Showtime Network, refuted many of the long-held misconceptions about the AFL. In it, Abner Haynes tells of how his father forbade him to accept being drafted by the NFL, after drunken scouts from that league had visited the Haynes home; the NFL Cowboys' Tex Schramm is quoted as saying that if his team had ever agreed to play the AFL's Dallas Texans, they would very likely have lost; George Blanda makes a case for more AFL players being inducted to the Pro Football Hall of Fame by pointing out that Hall of Famer Willie Brown was cut by the Houston Oilers because he couldn't cover Oilers flanker Charlie Hennigan in practice. Later, when Brown was with the Broncos, Hennigan needed nine catches in one game against the Broncos to break Lionel Taylor's Professional Football record of 100 catches in one season. Hennigan caught the nine passes and broke the record, even though he was covered by Brown, Blanda's point being that if Hennigan could do so well against a Hall of Fame DB, he deserves induction, as well. ↑ Gruver, The American Football League, p. 9. ↑ Gruver, The American Football League, p. 13. ↑ Gruver, The American Football League, pp. 13–14. ↑ Gruver, The American Football League, p. 14. ↑ Gruver, The American Football League, pp. 15–16. ↑ Miller, Going Long, pp. 3–4. ↑ "Kansas City Chiefs History – AFL Origins". Archived from the original on 2007-02-05. Retrieved 2007-02-07. ↑ Warren, Matt. September 4, 1985 – McGroder Joins The Wall Of Fame. BuffaloRumblings.com. Retrieved March 26, 2014. ↑ Gruver, The American Football League, pp. 22–23. ↑ Maiorana, Relentless, p. 65. ↑ "NFL History, 1951–1960". NFL.com. Archived from the original on 9 February 2007. Retrieved 2007-02-08. 1 2 3 4 Loup, Rich (2001-01-22). "The AFL: A Football Legacy (Part One)". CNNSI.com. Retrieved 2007-02-08. ↑ Carter, Al (1997-06-30). "Oilers leave rich legacy of low-budget absurdity". The Dallas Morning News. Archived from the original on 6 January 2007. Retrieved 2007-02-08. ↑ Herskowitz, Mickey (1974). "The Foolish Club" (PDF). Pro Football Weekly. Archived (PDF) from the original on 2007-06-05. Retrieved 2007-02-08. ↑ "Canadian Football League 1960 Attendance on CFLdb Statistics". 1 2 "NFL History, 1961–1970". NFL.com. Archived from the original on 5 February 2007. Retrieved 2007-02-08. ↑ "New York Jets history". Sports Encyclopedia. Archived from the original on 10 February 2007. Retrieved 2007-02-08. ↑ "Jets history – 1962". NewYorkJets.com. Archived from the original on 2006-11-14. Retrieved 2007-02-08. ↑ "Jets history – 1963". NewYorkJets.com. Archived from the original on 2006-11-14. Retrieved 2007-02-08. ↑ "1962 standings". Pro-Football-Reference.com. Archived from the original on 7 February 2007. Retrieved 2007-02-08. 1 2 "Chiefs timeline – 1960s". KCChiefs.com. Archived from the original on 2007-01-24. Retrieved 2007-02-08. ↑ Barber, Phil. "Gillman laid foundation for all who followed". NFL.com. Archived from the original on 8 November 2005. Retrieved 2007-02-08. 1 2 3 4 Silverman, Steve (1994-11-07). "The 'Other' League" (PDF). Pro Football Weekly. Archived (PDF) from the original on 2007-06-05. Retrieved 2007-02-08. ↑ "Bears Seek Data on AFL". Asbury Park Press. Associated Press. January 12, 1964. ↑ "Miami Dolphins Historical Highlights". MiamiDolphins.com. Archived from the original on 7 February 2007. Retrieved 2007-02-08. ↑ Dwyre, Bill (30 November 2009). "Barron Hilton's Chargers turned short stay into long-term success" – via LA Times. ↑ "Woodard in, Davis out in AFL". Milwaukee Sentinel. UPI. July 26, 1966. p. 2, part 2. 1 2 3 Cross, B. Duane (2001-01-22). "The AFL: A Football Legacy (Part Two)". CNNSI.com. Retrieved 2007-02-08. ↑ Maule, Tex (1968-01-22). "Green Bay, Handily". Sports Illustrated. Retrieved 2007-02-09. 1 2 "He guaranteed it". Pro Football Hall of Fame. Retrieved 2007-02-09. ↑ "Baltimore Colts history". Sports Encyclopedia. Archived from the original on 10 February 2007. Retrieved 2007-02-09. ↑ Jackman, Phil (1999-01-12). "Lifetime guarantee; Jets-Colts". Baltimore Sun. Archived from the original on 2007-09-30. Retrieved 2007-02-09. ↑ "Page 2's List for top upset in sports history". Page2. Archived from the original on 21 February 2007. Retrieved 2007-02-09. ↑ Wankel, Bob (2005-02-01). "Eagles can win with right strategy". The Courier-Post. Retrieved 2007-02-09. ↑ Gooden, Kenneth (2003-11-19). "Can Hornets match greatest all-time upsets?". The State Hornet. Retrieved 2007-02-09. ↑ Shamsky, The Magnificent Seasons, p. 5. ↑ "Super Bowl IV box score". SuperBowl.com. Archived from the original on 2007-01-01. Retrieved 2007-02-09. ↑ "1970 AFL All-Star Game recap". Retrieved 2007-02-09. ↑ Forbes, Gordon (2001-03-22). "This time, realignment will be cool breeze". USA Today. Archived from the original on 2004-08-29. Retrieved 2007-02-09. ↑ "Moment 26: Enter Art". ClevelandBrowns.com. Archived from the original on 2007-10-10. Retrieved 2007-02-09. 1 2 Sherrington, Kevin (2011-02-01). "Dallas meeting in '66 saved Steelers from stinking". The Dallas Morning News. Retrieved 2011-02-06. ↑ Jim Acho (1997). The "Foolish Club". Gridiron Press. OCLC 38596883. Foreword by Miller Farr. ↑ "Black football players boycott AFL All-Star game". The African American Registry. Archived from the original on 2006-12-25. Retrieved 2007-02-09.